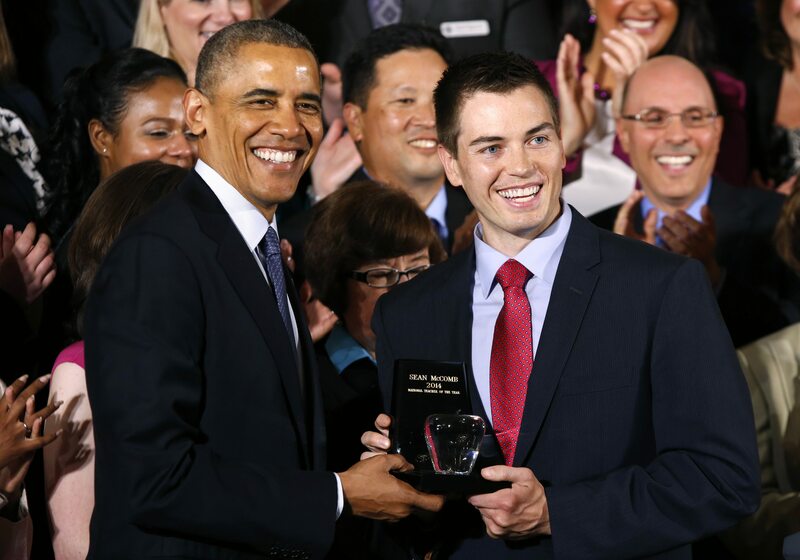 President Obama honored Baltimore teacher Sean McComb at the White House Thursday as the National Teacher of the Year, while praising the dozens of other teachers who were finalists for the award as a guiding force in their students' lives. "I still remember all of the wonderful teachers who made me who I am, who opened the world up to me," the president said. "They set us on a better path, and they do it even though we ask so much of them. Teachers don't get an off day, even when they're exhausted, even when you're up all night with your own kid, even when you've got bills or something personal on your mind, once you're in front of that class you've got eager minds depending on you." At just 30 years old, McComb, the Teacher of the Year, is one of the youngest recipients of the award. In an interview with CBS News' Chip Reid, he noted that he had his own struggles as a student. "I was always the student with potential, but sometimes I didn't meet that potential. I had a lot of struggles in my home life. My parents both went through some periods of unemployment. My mother was an alcoholic, and our home life was challenging a lot of times. There was a lot of chaos," McComb said. It was some of his own high school teachers who inspired his career choice. He is now teaches English at Baltimore's Patapsco High School and Center for the Arts, though that he teaches students above any subject. "I became a teacher because I had incredible teachers who were able to shine a light of hope and possibility into a dark time in my life," he said as he accepted the award. "Teaching is my calling to do that for others." He quoted some of the lessons he had learned from his own students: that bearing burdens can make you stronger, and that people's lives not determined their past, but rather by present choices and faith in our future. As McComb closed, he noted that educators are always working to be better, but asked that, any changes "must be done with civil and critical conversations that respect the knowledge and experience of our classroom teachers...we stand here because of those important people who invested in each of us, and here we stand for the importance of investing in each and every child." Mr. Obama noted that investing in education has long been a top priority, and that teachers deserve the support of all Americans. The recipient of the National Teacher of the Year is chosen from among the State Teachers of the Year by a national selection committee that represents the major national education organizations organized by the Council of Chief State School Officers, according to the White House.